What are you doing on New Year's Eve? If you haven't made up your mind, here are two opportunities to have it made for you. 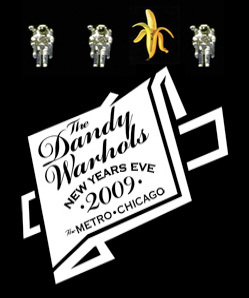 The Dandy Warhols are going to be performing at the Metro's NYE party, with Robert Been of Black Rebel Motorcycle Club DJing to open. The show is 18 and over, and doors open at 9pm. Tickets are $55 in advance ($65 at the door), or $125 for VIP, which get you special seating, four free drinks and limited edition posters. The Metro is running a contest to upgrade one lucky ticketholder and three of his or her friends to VIP status. All you have to do to enter is purchase your tickets by Saturday, Dec. 20. Winners will be announced on Monday the 22nd. But that's not all! The Metro has also given Transmission two pairs of tickets to give away! Enter to win by emailing contests[at]gapersblock.com with "NYE" in the subject line; include your full name in the body of the email. We'll select two winners from the entries on Friday, Dec. 19, so that if you don't win you still have time to enter the Metro's contest. Update! We have our winners! Congrats to Kit and Aubrey!